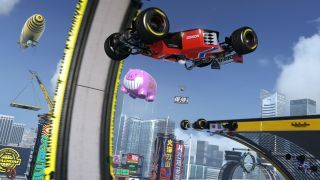 Trackmania Turbo, the latest instalment in the frenetic, cathartic arcade racing series, was delayed from its November 2015 release in order to "enhance the campaign and the game’s interface", get the online infrastructure stable and add in a new user-made map mode. Basically, finish the game. That finishing line is finally in sight, with Turbo set to release March 25. Judging by the footage released so far, Turbo doesn't look too different to the chaotic Trackmania we've come to know, only with a more flagrant disregard for gravity than ever before. If you too despite the inexorable downward pull, Trackmania Turbo will cost you £30/$40 after its release week discounts wrap up.